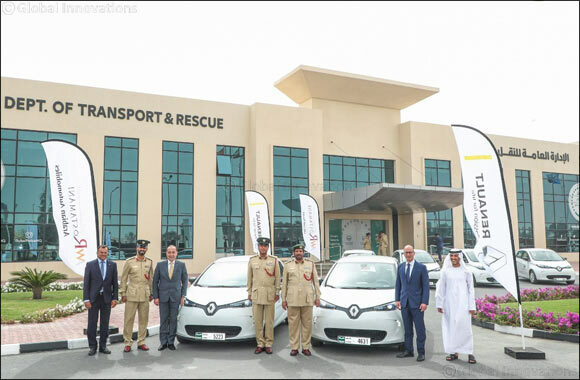 Dubai, United Arab Emirates, April 15th, 2019: Dubai Police today announced that is has added 13 Renault ZOE electric cars from Arabian Automobiles, the flagship company of the AW Rostamani Group and the exclusive dealer for Renault in Dubai, Sharjah and the Northern Emirates, to its patrol fleet. The collaboration between Dubai Police and Arabian Automobiles is in line with the UAE Vision 2021 National Agenda which focuses on improving the quality of air and promoting sustainable development. It also underlines the commitment of Dubai Police to promote green and eco-friendly initiatives. Arabian Automobiles has been at the forefront in promoting sustainability in the region and is a committed partner in supporting the green vision of the UAE leadership. The Renault ZOE, a compact electric vehicle, is ideally suited to support the vision of Dubai and the UAE's leadership to promote energy use efficiency by leveraging sustainable modes of transport. It generates zero emissions in use, thereby reducing harmful air pollution. As seen in the picture, Brig. Dr/ Mohammad Al Razooqi, General Director - General Department of Transport and Rescue and Brig. / Ahmad Shuhail, Deputy General Director – General Department of Transport and Rescue and Lt. Colonel/ Sultan A. Ali Almarri, Fleet director- General Department of Transport and Rescue at Dubai Police, Mr. Salah Yamout, Director of Sales and Marketing and Mr. Ahmad Zaher Sabbagh, Deputy General Manager and Mr. Mohammed Essa Al Qubaisi, Manager at Arabian Automobiles Company.